Takanori can see inside your soul. T.M.R hasn’t been around for a little while. 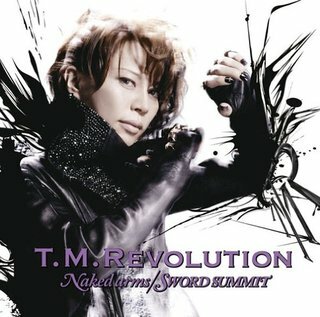 Takanori himself has been active with abindgon boys school and the field of being awesome, but he hasn’t “made revolution” since 2008’s Resonance, which was a fantastic song. I am still a relatively new T.M.R fan so I’ve had his entire discography to tide me over during the wait for this single. Seasoned fans probably found the wait to be tougher since they had heard it all before. Man, I have good timing. Naked Arms picks up right where Resonance left off. It’s got attitude! Takanori’s vocals are out of this world. This man can seriously sing. I really liked the unpredictable melody that the songs boasts as well as the fact that the energy never dies out during the song. There isn’t a dull moment. Naturally, the PV for this song is delightfully camp (Takanori seems to really enjoy being on camera, okay?) with an interesting usage of color, or lack thereof. This song wasn’t as good for me as Resonance but it’s still a fresh track and a great reminder that even after two years T.M.R is still going strong. I still don’t know exactly how I feel about SWORD SUMMIT yet. I like it, but there’s something too perky about it. I’m just waiting for this to turn up on Dance Dance Revolution (alongside GACKT’s Koakuma Heaven, hehe). I definitely dig how the flute was integrated into the song at the instrumental break. This song is DDR-meets-Pokemon-battle. Yep. In Conclusion: I was blown away by this single. T.M.R is just brilliant, simply put. Naked Arms is an epic win for sure and SWORD SUMMIT grows on me with each listen. Highly recommended! My latest poll has concluded and surprisingly the choice I voted for won! The majority of voters (22 people) agreed with me that an ideal song last between four and five minutes. Close behind, nineteen people voted for a song between three and four minutes which is totally understandable. Two people voted for songs between two and three minutes. Must have been k-pop fans. Aren’t k-pop songs typically shorter, or is that just my wacky imagination? One person voted for songs between five or six minutes and one person voted for songs over six minutes. That last person HAD to be a Versailles fan. They just HAD to, okay? There was zero love for songs in between one and two minutes. Awww, come on! DDR songs are that length! I don't like that she was photographed in the Every Konami Photoshoot Ever room. I think they even filmed BeForU's Ki-se-ki PV in this room. At least she looks cute. I am going to feel fifteen all over again in writing this review. Please bear with my overwhelming nostalgia. I don’t blame you if you’ve never heard of Sana (full name Sanae Shintani). She is an artist who has worked on Konami’s line of Bemani music/rhythm games a la Dance Dance Revolution, pop’n music, and the like. We can’t all be like me, a person with a playlist of three hundred or so Bemani songs on their iPod. Sana is one of the more popular artists from Konami’s Bemani games and aside from BeForU, my favorite. 10 Indigo Bird ! ! ! ! I found myself impressed to an extent with Liebe ~望郷~. It reminds me of something Kalafina would put out, only less operatic. Sana’s voice falls a little flat at times, but the song has an interesting and medieval melody. I haven’t heard her perform any songs like this one, so it was a nice change of pace. 神秘の森 is so incredibly soft that sometimes I couldn’t even hear Sana! Its quite relaxing but a little too quiet. 紅蓮の焔 ~原題:紅蓮心中~ (good grief, I hope that’s the entire title) was the worst track on the album. The music is about six thousand times (rough estimate 😛 ) louder than the vocals. The tune is dissonant, to say the least, and Sana seems out of breath and desperate to keep up with the music’s tempo. What a mess! Oh my goodness, I love Indigo Bird! Relaxing, oceanic, tribal, its like what would happen if the Beach Course from Pokemon Snap was given lyrics. This song is wonderful and so full of life an happiness. Best track of the album, for sure. I didn’t understand the placement of White Eve on this album, as it already appeared on Sana Mode II. Still, being one of my favorite Sana tunes, I wasn’t too unhappy to see it again. This song is, as the name would probably tell you, a nice piece of winterpop. Its got a chilling melody and a beat that just sounds like a blizzard. Make sure to give the remix of Loveholic a try. Its well-done, not as good as the original, but does a good job of highlighting the tune without being techno overkill. In Conclusion: Sana has redeemed herself, somewhat, after that awful mess of an album Honeymoon. I wouldn’t recommend this unless you’ve already listened to the jaw dropping Sanative, Sana-mode, and Sana-mode II. Overall, an average album with a couple amazing tracks. At least listen to Indigo Bird if nothing else.